Contagion by Erin Bowman stars the ragtag crew of the Odyssey, a mining ship that responds to an SOS at a seemingly deserted base on a remote planet. Led by their determined by green captain Dylan Lowe, the team immediately begins searching for survivors but instead find a pile of dead bodies. The ship’s doctor, microbiologist Dr. Lisbeth Tarlow appears baffled at the cause of all the death and carnage, but her seventeen-year-old intern Thea Sadik suspects her mentor may know more than she lets on. Meanwhile, the Odyssey’s pilot Nova Singh struggles with her developing feelings for Dylan, even as the headstrong captain makes increasingly impulsive decisions that endanger her people. On the planet, the crew also finds a disturbing message along with a chilling video made by one of the personnel before he died. Not long afterwards, the group is separated and Thea’s life is saved by a mysterious young man who claims to be the only survivor. But who is he and where did he come from? How did he stay alive when no one else was spared by whatever killed them? Finding the answers becomes imperative as one of the Odyssey’s crew suddenly becomes infected with an unknown contagion, putting all of their lives at risk unless the outbreak can be contained. As someone who has seen my fair share of sci-fi/horror movies, books, games, comics etc. featuring some variation of the space zombie, I have to say Contagion was pretty mediocre and only mildly entertaining. To be fair, it’s tough to write a book like this, precisely because it’s been done before…so many times before. Some authors attempt to spin the story a different way, or offer something unique as a hook. Personally, I love that. It’s what keeps me coming back to this genre. The problem here though, was I just didn’t see anything too special. Bowman’s a great writer, and certainly I would put her prose at a level above the typical YA novel, but truth be told, her atmosphere and suspense building could have been better, and any fan of horror will tell you, those two things are kind of a biggie. That said, it’s clear the author wanted the strength of her novel to be in her characters. She’s populated Contagion with a diverse cast, who were for the most part interesting to read about. Where the story stumbles, however, is the narrative mode. Told in third-person omniscient, we are bounced between POVs to cover no less than half a dozen of the crew members when really there’s only a handful of characters readers are made to care about. The rest felt like distraction and served to weaken the character development as a whole. I want to say I liked the characters, but the reality is I didn’t feel like I got to know any of them too well, and no one really stood out as all that unique or special. Kind of like this book (even though it makes me feel crummy to say it). The action is what drove much of the entertainment. Even then, the suspense was a bit muted because I wasn’t invested enough in the characters to feel the full emotional impact even when terrible stuff happened to them, but at least the story wasn’t boring. The world was also intriguing, though I have the feeling we’ve only scratched the surface. The hints of political intrigue and corporate conspiracies given here don’t play much into the plot, though I wish they had. The ending also closes on a rather blunt “to be continued”, so I assume much of the set-up here will be elaborated upon in the sequel. Ultimately, I found Contagion to be a very middle-of-the-road read—entertaining enough, but nothing special to write home about. Still, despite my mixed feelings, I have not dismissed the possibility of continuing with the series, though I’ll probably wait to read a few reviews of the next book before making my decision. Audiobook Comments: I think Amy McFadden did a great job narrating, but some books just beg for multiple narrators. 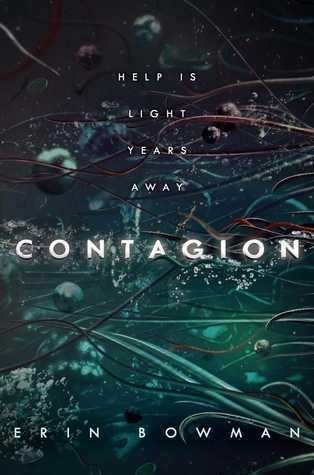 Given the number of characters in Contagion and their different personalities and voices, the addition of more narrators here probably would have benefited the flow of the story and increased my interest, but overall I still enjoyed the listen. I was thinking of reading this one next- initially I wasn’t even that interested but then I started getting the itch to read some SF with a horror slant- so I’ve been watching for reviews. I saw another review that was just mediocre as well, so I’ll keep my expectations in check going in. It wasn’t bad, but if you’ve seen your share of space zombie stories, then you’ll probably find this to be your same old, same old. The premise is one I would enjoy as well: there is nothing more intriguing than the mystery of a deserted, remote base where everyone is found dead – and by an equally mysterious disease. But you’re right: this path might be well-trodden, and to make it interesting it needs something more, something that distinguishes from the countless others dealing with this theme. It really has! I had a feeling based on the blurb that I would be delving into familiar territory, but I guess I had hoped it would surprise me. I am a big fan of the single POV and so an author has to do things really well for multiple to work for me. Sadly, I’m seeing less and less of the single pov as the books, and story lines, are expanding. I am a big epic fantasy reader so multiple POVs don’t bother me too much 😀 They still have to be done well though. I find the reason a lot of authors struggle is because they bite off more than they can chew. I was hoping for a higher rating from you on this book, because I’ve been seeing a lot of good reviews floating around. I still need to read it, hopefully I can pick it up this month. I wouldn’t mind trying more of her books. Hopefully their stories will be a bit more unique! Great review! I actually enjoyed this one a lot – I think I gave it 4.5 – but the points you made were still super valid, and I like when I can read a review of a book that’s different from my own rating and still find myself agreeing with it. 🙂 I think that just illustrates how well thought out your reviews are! Oh I don’t mind! The problem is the sheer number of recommendations, lol! But for someone returning to the genre, I would say go for something a little lighter, or try some YA sci-fi. I love John Scalzi, and his stuff was my gateway into sci-fi back when I was just getting into the genre. His humor made it easy! And oh, have you read the Illuminae trilogy by Amie Kaufman and Jay Kristoff? It’s amazing! Thank you so much! Your comment actually reminded me that I’ve been wanting to check out some of John Scalzi’s work, so I’m going to do that ASAP! And yesss, I LOVE the Illuminae Files – one of my fave series of all time and actually the reason I started trying to give sci-fi another chance! 🙂 Thank you! This sounds very ‘Alien-esque’ and also maybe a bit not for me. I like the tension to be cranked up. The premise sounds so good, but I’m with you on needing some new angle. Yeah, I don’t mind these common or popular tropes. But I’m going to need a twist or something more to give a higher rating.